The Let's Move! Rockbridge project in Virginia set out to address obesity from three different angles by challenging local businesses to make at least one positive change, encouraging physicians to conduct more Body Mass Index (BMI) screenings, and creating a community event to celebrate healthy behaviors. With support from the Office of Disease Prevention and Health Promotion (ODPHP), the Let's Move! 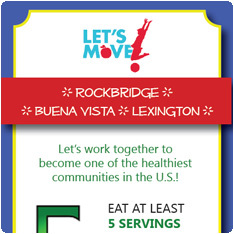 Rockbridge project grew from a partnership between the Rockbridge Area YMCA and Let's Move! Lexington. To develop this project, the Rockbridge Area YMCA met with a wide array of 20 government, business, community, academic, and health care agencies to determine how best to tackle obesity in their county. "We met with our partners before we even won the project so there was buy-in from as many partners as possible," said Melody Tennant, the project’s coordinator. "Our main goal was to show people how fun being healthy could be." When the Let's Move! Rockbridge project distributed 5,000 BINGO cards to all of the elementary and middle schools and another 10,000 bookmarks to the schools, community organizations, and businesses in their county, they were surprised by how popular the cards became in their community. "My daughter planned our entire spring break around completing the BINGO cards!" said one mother. "She completed all of the activities and didn’t even cheat!" Others are still using the cards months after this project ended. The Let's Move! Rockbridge project went to doctors' offices to encourage physicians to perform BMI screenings. What they found was that although many did screenings, they did not have time to discuss the importance of the results with their clients. This project helped doctors see how they could use their bookmarks and BINGO cards to have that conversation with their patients. To reach businesses, the Let's Move! Rockbridge project and their partners sent a letter to all of the restaurants in town to encourage them to make one positive change in their menus. Although many businesses were hesitant to commit to making any changes, a handful welcomed the idea. One local business owner adjusted his restaurant's menu to include healthier food options. "It was about time," he said. "My girlfriend has been suggesting that I include more healthy food items on our menu for some time now." After the grant period, Let's Move! Rockbridge and other grant partners worked with the local grocery store to host a Smart Shopping Day. They created two baskets of food that were comparable in price – one with healthy food items and one with unhealthy food items – so that their customers could get ideas on how to shop for healthy food. As a bonus, kids who came out of the store with a fruit and vegetable were entered into a drawing. In addition to associating "fun" with "health," the Rockbridge Area YMCA wanted to make sure that their project would have a broader effect on their community as well. "We didn’t want it to be a one-shot deal," said Ms. Tennant. "We wanted to develop something that had a lasting impact on our community." They partnered with schools, businesses, and the local newspaper to distribute promotional materials, have inspirational speakers visit schools, and write stories about those in their community who were leading healthy lives. The success that the YMCA and Let's Move! Rockbridge had in their community did not go unnoticed. Even though the project is now technically over, Let's Move! Lexington is still receiving calls from other organizations in the community asking if they could also develop partnerships. "We've never had this much benefit from working together and supporting one another!" said one partner. An inclusive organization of men, women and children joined together by a shared commitment to nurturing the potential of kids, promoting healthy living and fostering a sense of social responsibility.